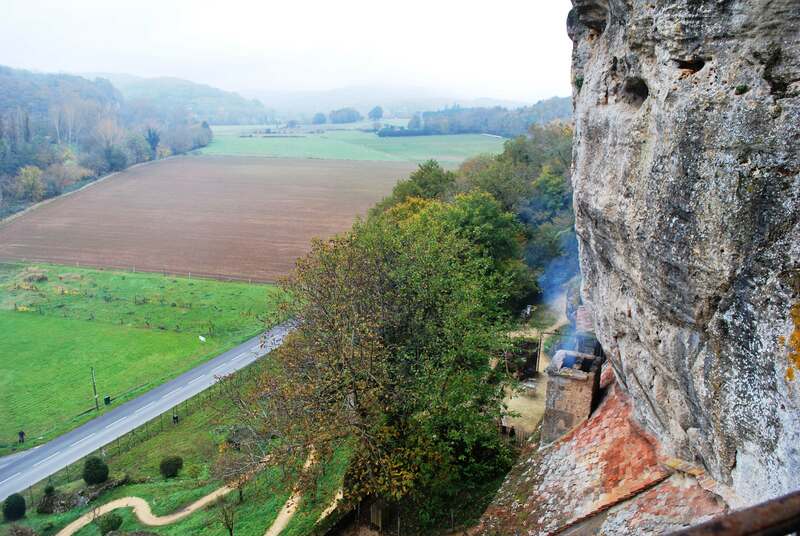 When we were in the Tourist Office in Sarlat, we were told about a castle built in a rock cliff face, called Maison Forte du Reignac at Tursac. So we decided, as it sounded so unusual and although out of our way, we would visit it on the way back to Chalon. 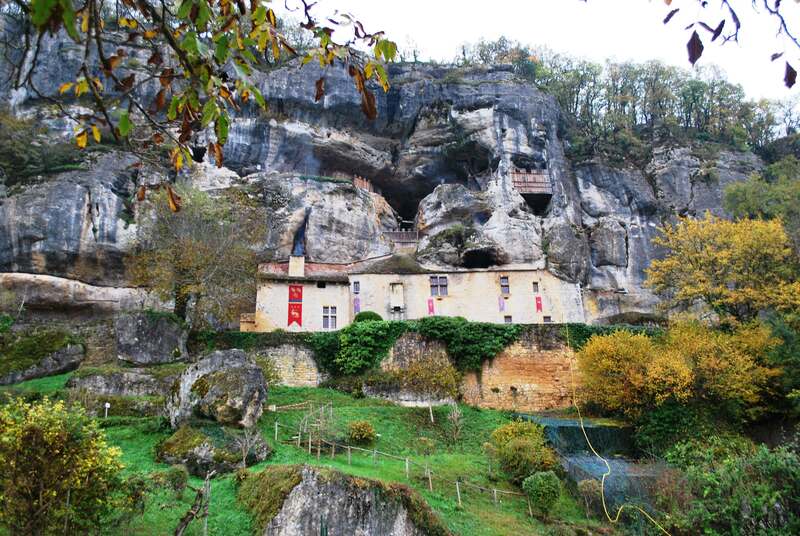 In the Perigord area, there are lots of limestone caves, in which man has lived in since prehistoric times. There are many different types of caves, some with crystal formations and others with wall drawings going back thousands of years, but what caught our attention was the advertisement for the one that was a castle built in caves. People started to live in these particular caves since the start of the 14th Century and over time, the dwelling developed into a full defensive castle. The same family owned it until the 1950s. It was then bought by the local council and archaeological investigations were carried out on the site for the next 20 years and the public were not allowed in. Some of the finds are displayed in a room in the castle. The castle was then bought by a private citizen who renovated it and opened it up to the public. It’s an amazing place as it is a castle built into a rock face and for centuries it operated like any other chateau in the area. It has strong fortifications so that it could resist attack as the only way it could be penetrated was from the front. As it was a secret place and not known outside the area, it was never attacked by any large army. It is surprisingly large, with kitchens, sitting rooms, bedrooms, arms room, chapel, jail and warehouses for storing food stuff. On the higher levels it has balconies from where the cannons were manned. From these balconies you have a commanding view across the valley and river below. 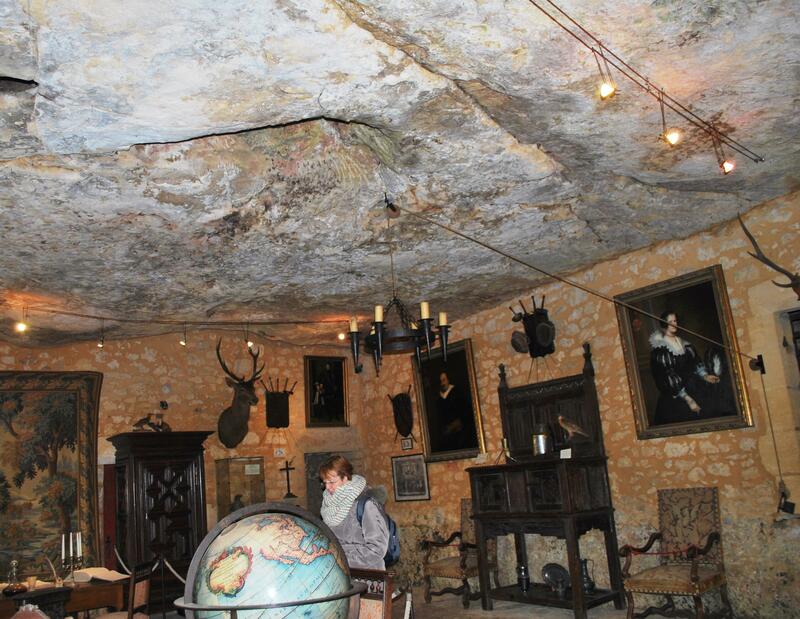 If you look closely at some of the photos you can see that the cave walls form the ceilings of some of the rooms. The local lord lived in it and it operated the same as any castle, ruling and managing the lands around it. The local lord was in charge of metering out justice in the area and protecting his lands and subjects. It has seen a lot of history; The Crusades, The Pope moving to Avignon, French Revolution, First and Second World Wars. Apparently its bells were rung when the Allies landed in Normandy (a brave act as the Germans still controlled the Perigord at the time) and again at the ending of World War Two. It is certainly the most unusual castle we have visited in all of our travels. Our Gap Year is still throwing up new sights and adventures! This entry was posted in On the Journey, Places visited and tagged Chalon, First and Second World Wars, French Revolution, limestone caves in Perigord region of France, Maison Forte du Reignac, Mansion in a Cave- Reignac Castle, Perigord, The Crusades, The Pope moving to Avignon, Tursac. Bookmark the permalink.